NFL’s COLOR RUSH Needs to be Stopped! Stop the madness! Stop the madness please! 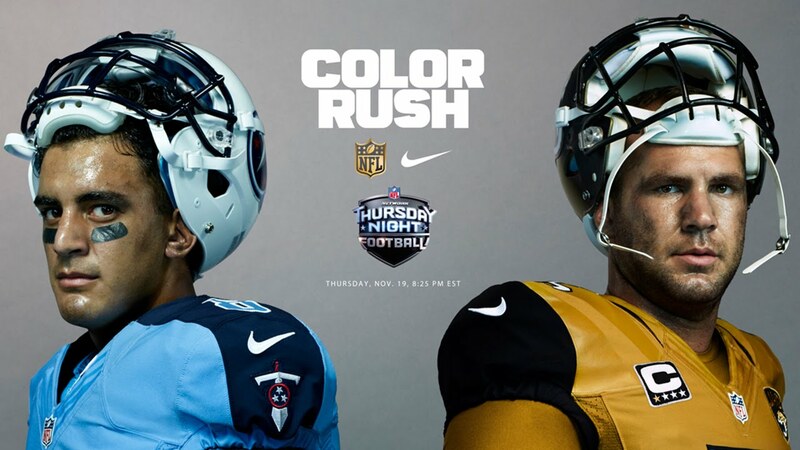 Two weeks into the NFL’s Color Rush uniform program it is clear that this idea was terrible. No, it’s no just that last week’s designs left millions of color blind fans scratching their heads trying to figure out which team had the ball, or that it looked like Christmas vomited in the Meadowlands. the powder blue color in the past but the monotone light blue look is horribly. That’s the main problem with the color rush uniforms is that it’s basically one solid color. If the pants or even the socks were a different color it would balance out the uniforms much better. Instead the Titans looks like oversized infants in baby blue onesies. And then there are the Jaguars, or the Gold Rangers from Power Rangers. I really can’t tell the difference. This isn’t even a Notre Dame gold and looks like the mustard one might find in the back of the cabinet that’s five years past it’s expiration date. What’s even worse? The fact that the Jaguars didn’t go with a all gold helmet but keep their terrible two-tone helmet that’s already a disaster. Do I give the NFL credit for trying something new? Yes, but this idea just seems like a quick cash grab in order to sell more jerseys. Instead of pushing the envelope with new or innovative designs, the league has just decided to basically keep the same uniform, dose it in one bright color and they’re done. I love the idea of new uniforms and having the Thursday game be the embodies different uniforms but the NFL is missing a golden opportunity. Instead of Color Rush the NFL should do Throwback Thursday next season. That way fans can see the great looks of the past while fans of those respective teams can buy the throwbacks at the team store. There are so many teams with great throwbacks it’s an opportunity for the NFL to not only make additional revenue off of uniforms, but to honor it’s rich history. Just look at what could have been this week. The Titans could have worn their Oilers throwbacks. What about the Jaguars? Even though Jacksonville has only been in existence since 1995, they still can use throwback uniforms. My suggestion would be their original 1995 uniforms which utilize their original logo and teal colors. There are so many teams with iconic throwbacks and it would be great to see them again. A couple of favorites could be the Elway Broncos, the Eagles kelly greens, and of course the Bucs creamsicles. The hashtag throwback thursday has already become a staple in pop culture, so why can’t the NFL utilize this? There are plenty of great opportunities to honor the past uniforms rather then just running out this monotone disasters that are the Color Rush threads. I understand that Color Rush is here to stay for this season, but can we please let these terrible uniforms go after the season and give the people what they really want? Throwback Thursday Night Football. Next ChipWreck: Is This Chip Kelly’s Last Year in Philly?